Savory, a little smoky and a little spicy! 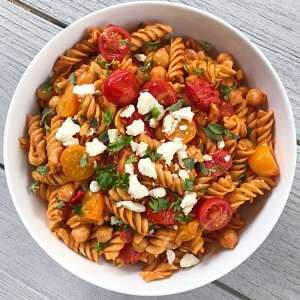 Savoring Summer tomatoes while they last with this quick and easy pasta dish. This simple pasta has a unique, complex & unbelievably delicious combination of flavors. The details…. Sautéed tomatoes, chickpeas, smoked paprika, fresh marjoram, Italian parsley & crushed tomatoes all tossed with a gluten-free chickpea rotini & topped with feta. It’s a little savory, a little smoky, a little spicy and A LOT delicious! Recipe adapted from Vegetarian Times . A simple 20 minute pasta with a unique, complex and unbelievably delicious combination of flavors. Seasoned with smoked paprika, marjoram and Italian parsley, it's fresh and slightly smoky. Add in some extra crushed pepper and it can be a little spicy (if you want!). Recipe adapted from Vegetarian Times. Bring a large pot of salted water to a boil, and cook pasta according to package. Before draining, reserve 1 cup of pasta water. While the pasta cooks, in a large skillet, over medium heat, heat 1 tablespoon oil until shimmering (not burning). Add tomatoes, and stirring occasionally, cook 10 minutes or until tomatoes start to blister. Stir in remaining 1 tablespoon oil, garlic, paprika, and red pepper flakes. Add tomatoes paste and stir over heat for about 1 minute. Fold in chickpeas, then parsley and marjoram. Sprinkle with feta with using and serve!